I have mentioned before during this 5K journey of mine that my father-in-law is a runner. He is a serious runner with all of the gear and gadgets, fancy shoes and training schedules. He is the guy that you don't tell you are training for a race because he would jump on a plane and fly to Texas to run with you. But if he did find out about this whole 5K deal he would be really proud of my newest running gadget. It is actually one that he owns himself. The Polar FT7. It may look like a watch, and it does give you the date and time, but its real job description is a heart rate monitor. There are a lot of different ways that you can measure your running pace, but a heart rate monitor will actually tell you how your body is handling that pace. The Polar FT7 has an energy pointer display that will tell you if you are burning fat or if you are improving your fitness and it will alert you when you switch from one to the other to help you stay where you want to be. Whatever your goal is, it will make sure you are running, walking, or cycling at a pace that helps you reach that goal. The Polar Heart rate monitor is really easy to set up and use. After you have entered your information like age, height, and weight, you are all set to go. You put on the transmitter, a strap that you wear around your chest, start the training computer (aka the watch look alike) and start working out. As long as your workout lasts more than a minute it will automatically store your data. If you want to keep track of your results long term, you can transfer them to polarpersonaltrainer.com where you can create a training program and training targets that will help keep you motivated and allow you to track your progress. The heart monitor is probably my favorite training device because even though I am running at a slow pace, I know the exercise is doing exactly what I want it to do. I know just how far to push myself to slowly and steadily increase my speed, without pushing myself so hard that I hate running. Slow and steady wins the race, right? I want one of you to have the opportunity to make the most of your workout with this water-resistant heart rate monitor and watch system. Leave a comment here telling me what your Inspiration to Fitness goal is and you will be entered to win a Polar FT7 Women's Heart Rate Monitor. Rules: No duplicate comments. You may receive (2) total entries by selecting from the following entry methods: a) Leave a comment in response to the sweepstakes prompt on this post b) Tweet about this promotion and leave the URL to that tweet in a comment on this post c) Blog about this promotion and leave the URL to that post in a comment on this post d) For those with no Twitter or blog, read the official rules to learn about an alternate form of entry. This giveaway is open to US Residents age 18 or older. Winners will be selected via random draw, and will be notified by e-mail. You have 72 hours to get back to me, otherwise a new winner will be selected. The Official Rules are available here. This sweepstakes runs from 2/8 - 2/14. Make sure to stop by to visit the Inspiration to Fitness page on BlogHer.com where you can read other bloggers' reviews, get great fitness tips and find more chances to win! You can also roll over the Best Buy image at the top of my blog to view a calendar of all the Inspiration to Fitness content. Good luck! Have you taken the fitness pledge? Disclosure - This is a compensated review from BlogHer and BestBuy. I received the Polar FT7 to use for the purpose of this review. All opinions shared are my own. The Polar Heart Rate Monitor I purchased almost 10 years ago has been BY FAR the most valuable piece of fitness motivation I have ever purchased! It's been way overdue to be replaced....I would LOVE to win won!!!! Definitely something I cannot live without! This would definitely be an aid to reach some of my fitness goals! So cool! My goal is to run another 1/2 marathon, but this time in a decent time. I was way to slow last time. And I want to lose about 8 more lbs. This monitor would be so incredibly useful! My fitness goal is to run a half marathon with my husband. Running has always been a hobby of his and I would like to join him! After having 5 awesome kids, I'm ready to have a hobby of my own! :) The Polar would be very helpful in training! My fitness goal is to push myself a little harder every time I get out there. My fitness goal is to stay healthy and keep running half marathons! I meet my first goad 3 years ago - ran a 5k, meet the biggest goal this week - no more blood pressure medicine. Next goal Chicago half marathon in September. I used to run 6 days a week. Then I stopped after 2 miscarriages and a baby. Im now 50 lbs heavier than I was then but I have started running again and it feels SO good! Its been 3 weeks and im up to 1.5 miles. I feel so proud. The goal is a 5K in Dec and a Mud Run 4 miler this summer. I Have to do it. Not for anyone else, just for me. I dont have a job and live off my husbands military pay. But I have tons of motivation. I need a watch :) Help me reach my goal!!!! Thanks! I turn 30 in two months and, after two kids, I would love to be the weight I was when my husband and I got married. That is my fitness motivation! I cannot say enough great things about the Polar Heart Rate Monitor!! Mine is an older style..but it still does the same things! I wear it religiously when I work out...what I love the most is that you know how many calories that you have burned during your workout and then in the diary you can see how many you burned for the whole week!! If you are losing weight this is the ultimate!! Mine is now a VERY faded pink and I would love to win this one!! I would love this! I am 14 weeks pregnant with number 2 right now and it would be awesome to know what my heart rate was while working out pregnant. Then after this baby I want to start running again. This would be awesome!!!! My goal is to PR in the Cherry Blossom 10 Miler by at least 5 minutes and to run my first marathon later this year. Hopefully I'll get into the Marine Corp Marathon! My goal is to do a 1/2 this year. My fitness goal is to lose about 10 pounds this year, and to be able to run over 5 miles. But if I reach 5, that's okay! This would totally help me train! Oh man I would LOVE to win this one!!! My fitness goal is to lose 70 lbs this year. I joined a gym, met with a trainer and discussed a plan of action. I learned for the first time about heart rate and fat burning vs cardio training. This would be an amazing tool to keep me motivated! Thanks for the giveaway! I hope, hope hope I win! My fitness goal is to move more, consume less, and be healthy! Oh i'd love to have one! I loved my old heart rate monitor but it finally broke. My fitness goal would be to loose 2 pant sizes to be a healthy weight to have kids! Thanks for hosting! My fitness goal is to get back in shape after having a baby in November. I was training to do a mini triathlon before getting pregnant and want to get back at it. This monitor wold really help with that! My inspiration to shape up is my dad, who had a fatal heart attack at 42. Looking at forty myself has me thinking, and changing the way I do things. 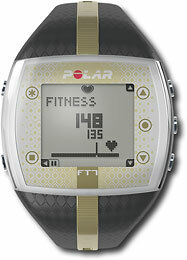 The Polar FT7 sounds like a personal trainer and cheerleader in a handy little device. Thanks for the review! I'm training for the Ragnar. I would love this! I just started working out again, 3 weeks ago, after a year of laziness. My fitness goal would be to be swimsuit ready by the time we go to Florida in June!!! My goal is to lose weight, get fit and lower my BMI. I have hit OBESE stage and just want to lose the weight and be healthier...oh, and to run a 5k. I've walked a few in the past, but never ran one. I have wanted a Polar Heart Rate monitor for the last 3 years. I actually priced one way back when while I was working but as finances changed I haven't been able to get one. Winning one would be the 'bees knees'! My fitness goals this year is to finally lose this weight I've been carrying around for the past few years. My goal is to get into better shape! I have my 30th High School reunion this Summer and I would like to turn some heads! My goal is to do ONE chin-up this year! I am working up to a full chin-up by doing band assisted ones and using the assisted machine at the gym. I am getting really close!! This would be awesome since my hubby and I just started p90X. I have 18lbs to loose after baby number two. I would love to be able to know if I am staying in my zone. I've lost 55 pounds over the last year and taken up running for the first time in my life. My fitness goal is to continue to tone up and slim down...to keep getting healthier. My fitness goal is to run an entire 5k without stopping to walk - the heart rate monitor would be a great tool to help! I am training to run a 1/2 marathon next year - and yes, it will probably take me that long to get there. I can currently run 1 mile without stopping. Having the Polar FT7 would be pretty handy to help me achieve my goal. I love using a heart-rate monitor. It is the most useful piece of exercise equipment, right along with my IPod shuffle. Mine is seven years old, and I keep thinking it might be on it's last legs. Love to win one!